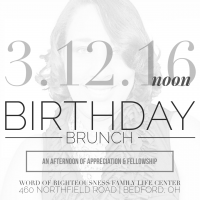 The women of Excel Church will host its first Birthday Brunch for Pastor Alicia Lytle. The event will be held on Sunday, March 12th. See the Events page for details.